The only text in the market to include all three major areas of coverage in the typical American Foreign Policy course–history, process, and current policy issues–this is a highly accessible, up-to-date introduction written with a deep understanding of history and thorough attention to today's changing world. For the first time, the three major area of the typical American Foreign Policy course are now given indepth coverage in a single book. 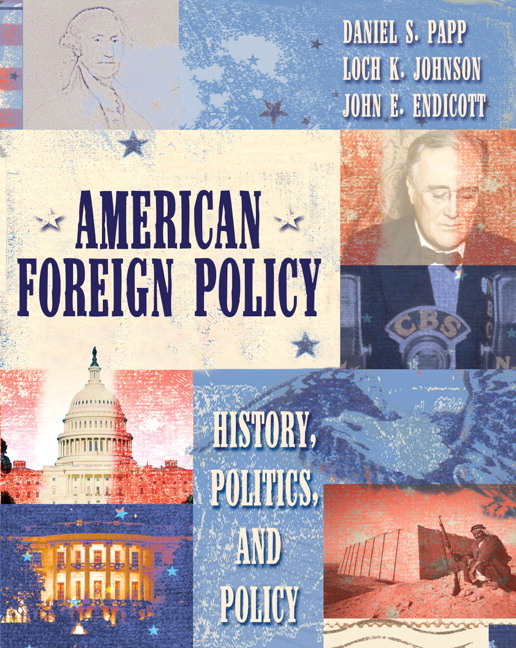 American Foreign Policy: History, Politics, and Policy comprehensively presents: 1) the background and history of U.S. foreign policy as far back as the 18th century; 2) the politics and processes of U.S. foreign policy formulation; and 3) analyses of current foreign policy issues. Providing sufficient depth for understanding but avoiding unnecessary jargon, this is an engaging, straightforward text written specifically for undergraduates. Abounding with real-world case examples, brimming with historical context, and offering up-to-date coverage of contemporary topics, this text is sure to engage student interest and give them the tools they need to examine and evaluate American foreign policy. Uses “levels of analysis” (individual, national, international) as a conceptual framework throughout the text, helping students understand that, no matter what topic is being studied, all aspects of foreign policy can and should be viewed from multiple perspectives. Integrates three competing themes that have played and will continue to play a prominent role in American foreign policy: realism vs. idealism, isolationism vs. involvement, unilateralism vs. multilateralism. Includes chapters and case studies on four major U.S. foreign policy issue-areas: defending the homeland, economics and foreign policy, military intervention overseas, and human rights and democratization. Provides the strongest historical coverage of U.S. foreign policy on the market. The text explores the roots of U.S. foreign policy back to the 18th Century, giving students a deeper appreciation for where we came from and why we conduct policy as we do today. Provides readers with a solid grasp of the internal and external policy issues that confront today's U.S. foreign policy planners, decision-makers, and practitioners. Juxtaposes current issues and concerns with history to provide analytical depth to current issues and concerns. This text is also available as a SafariX WebBook. SafariX Textbooks Online is an exciting new choice for students looking to save money. As an alternative to purchasing the print textbook, students can subscribe to the same content online and save up to 50% off the suggested list price of the print text. Students can search the text, make notes online, print out reading assignments that incorporate lecture notes, and bookmark important passages for later review. For more information, or to subscribe to the SafariX WebBook, visit www.safarix.com. Note: All chapters conclude with a chapter summary. I. THE STUDY OF AMERICAN FOREIGN POLICY. 1. Introduction to Foreign Policy. Three Levels of Analysis: An Overview. Level One: The International Level. Level Two: The National Level. Level Three: The Individual Decision-Maker. A Road Map for Foreign Policy Analysis. 2. Unifying Concepts and Competing Themes. Another Viewpoints: American Foreign Policy Through Latin American Eyes. II. THE BACKGROUND AND HISTORY OF AMERICAN FOREIGN POLICY. 3. Finding A Place in the World: 1756-1865. The American Colonies and States in a Global Context: 1756-1789. The Foreign Policy of an Infant Nation: 1789-1815. Continental Expansion and Hemispheric Interests: 1815-1848. Trade, Hopes of Empire, and Civil War: 1848-1865. 4. Building an Empire: 1865-1914. Territorial Expansion, Foreign Trade, and Regional and Global Interests: 1865-1895. Expanding and Consolidating the Empire: 1900-1914. Missions, Interests, Principles, and Competing Themes at the Start of the Twentieth Century. 5. Becoming a Global Power: 1914-1945. American Foreign Policy During World War I: 1914-1918. American Foreign Policy During World War II: 1941-1945. How Do You Rebuild a Shattered World? 6. Fighting the Cold War: 1945-1989. The Post-War World Before the Cold War: 1945-1947. Truman, Eisenhower, and the Cold War: 1948-1961. JFK, LBJ, and the Crises of the 1960s. Grand Strategy Under Nixon and Ford: 1969-1977. From Détente and Human Rights to Renewed Confrontation and Containment: 1977-1989. 7. Shaping the Post-Cold War World: 1989-Today. George Bush's Foreign Policy: 1989-1993. George W. Bush's Foreign Policy: 2001-Today. The Future of American Foreign Policy. III. THE POLTICS AND PROCESS OF AMERICAN FOREIGN POLICY. 8. The Presidency and Executive Branch in American Foreign Policy. 9. Congress, the Courts, and the Public in American Foreign Policy. Congress and Foreign Policy: An Overview. Taking the Nation to War. A More Complicated Foreign Policy. Public Opinion and Interest Groups. The Challenge of a Democratic Foreign Policy. 10. The Open Instruments of Foreign Policy: War, Diplomacy, Trade, Aid, and Reputation. Instruments of Trade and Aid. Moral Suasion and Soft Power: The Importance of Reputation, Ideology, and Culture. 11. The Secret Instruments of American Foreign Policy: Espionage, Counterintelligence, and Covert Action. Intelligence: The Nation's First Line of Defense. Counterintelligence: A Wilderness of Mirrors. Covert Action: The Third Option. IV. ISSUES OF AMERICAN FOREIGN POLICY. Early Issues of Homeland Defense. Modern Terrorism and Responses to It. The Threat of Weapons of Mass Destruction. 13. Economics and Foreign Policy: Trade, Finance and Currency. Early Issues of International Economics. The Rise and Fall of the Bretton Woods System. The U.S. and Today's International Economic System. Early Issues of American Use of Armed Forces. The Dilemmas of Power and Presence. Using Military Force in the War on Terrorism. 15. Human Rights and Democratization. The Meaning of Human Rights and Democratization. The U.S., Human Rights, and Democratization. Twenty-First Century Human Rights Debates. Case Studies: The Philippines, Nixon, and Cuba. Human Rights, Democracy, and the War on Terror.